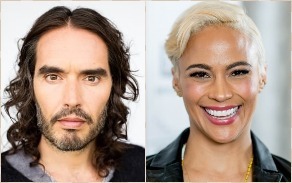 BAFTA nominated comedian Russell Brand (Get Him to the Greek, Forgetting Sarah Marshall) and SAG nominated actress Paula Patton (Mission Impossible: Ghost Protocol, Precious) have joined two-time Academy Award winner Michael Caine (The Cider House Rules, The Dark Knight) and Emmy nominated Matthew Goode (Netflix’s “The Crown”, The Imitation Game,) in the family action adventure film ‘Four Kids And It’, which is directed by BAFTA Award nominee Andy De Emmony (Channel 4’s “Father Ted”, West Is West). The children at the center of the family adventure are played by Ashley Aufderheide (Infinitely Polar Bear, Going in Style) and Teddie Malleson-Allen (Swallows and Amazons, BBC’s “Cider with Rosie”) who play two 13 year-old girls alongside Billy Jenkins (Netflix’s “The Crown”, AMC’s “Humans”) and theatrical performer Ellie-Mae Siame who play their younger siblings. Principal photography began on July 16th on location in Ireland. Produced by Dan Films’ Julie Baines and Kindle Entertainment’s Anne Brogan, the screenplay is written by Simon Lewis adapted from the novel “Four Children and It” by best-selling author Jacqueline Wilson. Additional writing is provided by Mark Oswin. Jwanwat Ahriyavraromp serves as executive producer on the film. 13 Films’ Tannaz Anisi and Gregory R. Schenz also serve as executive producers alongside Geraldine East. Paul Donovan of the Irish production company Deadpan Pictures and Dan Films’ Jonathan Taylor serve as co-producers. The film is being fully financed by Dr. Jwanwat Ahriyavraromp of T&B Media Global. 13 Films is handling worldwide distribution rights for the film. Four Kids and It is the fun, family action adventure story of four children who are horrified to learn that their beach holiday is in fact a bonding trip with their potential future step siblings engineered by new couple Alice (Patton) and David (Goode). During an argument, they accidently find a Psammead, a magical, sandy, grumpy creature called IT who can grant them one wish a day - only to see the wish cancelled as soon as the sun sets. The kids must learn to work together and choose their wishes wisely after an evil villain (played by Brand) makes it his mission to steal the Psammead for himself. The mythical IT, voiced by Michael Caine, is designed by acclaimed creature creators Brian and Wendy Froud. Brian is the conceptual character designer for Jim Henson’s The Dark Crystal and Labyrinth and Wendy is the original creator of Star Wars’ Yoda. The digitally created Psammead used in the film is being built by creature effects company MILK – the company behind the Oscar winning visual effects in Ex Machina. The film is boosted by an established below-the-line production team that includes two-time Primetime Emmy Award and BAFTA nominated editor, Alex Mackie (CBS’ “CSI: Crime Scene Investigation, Netflix’s “The Crown”, RKO 281) and Primetime Emmy Award nominated director of photography, John Pardue (Roadside Attractions’ Finding Your Feet, The Girl, BBC’s “Luther”). The film is based on Jacqueline Wilson’s retelling of the classic story Five Children and It written by E. Nesbit in 1902. Four Children and It was published in 2012 as part of the Puffin Classics 30 year celebration. Jacqueline Wilson is a celebrated children’s author whose titles have sold more than 40 million copies worldwide. Multiple books written by Wilson have appeared on the list of the 100 most popular books in the UK and she was named the most borrowed author in Britain’s libraries for six consecutive years. Russell Brand plays the local oddball villain Tristan bent on capturing the Psammead for his own gain. Brand shot to worldwide fame in 2008 portraying rocker Aldous Snow in Universal’s hit comedy Forgetting Sarah Marshall. His additional credits include Get Him to the Greek opposite Jonah Hill, Universal’s Despicable Me and Despicable Me 2, and the upcoming season of the HBO series, “Ballers”, opposite Dwayne Johnson. Brand is an award-winning stand-up comedian - his most recent live show, Re:Birth, will be released on Netflix later this year. Paula Patton plays American workaholic mum Alice. Patton’s first feature role was Columbia Pictures’ box-office hit Hitch starring alongside Will Smith, Eva Mendes, and Kevin James. She then went on to appear in Universal’s Idlewild, Déjà vu opposite Denzel Washington, and the Oscar winning film Precious, earning her a SAG nomination for “Outstanding Performances by a Cast in a Motion Picture”. Her additional credits include Paramount’s Mission: Impossible – Ghost Protocol, Universal’s 2 Guns starring Denzel Washington and Mark Wahlberg, and Universal’s Warcraft: The Beginning. Michael Caine voices the Psammead. Two-time Academy Award-winner and British film icon Caine is best known for his performances in Alfie, The Italian Job, Get Carter, Sleuth and The Man Who Would Be King. Caine won the Academy Award for Best Actor in a Supporting Role twice, first for Woody Allen’s Hannah and Her Sisters and again for Lasse Hallström’s The Cider House Rules. A frequent collaborator of visionary director Christopher Nolan, Caine has appeared in Nolan’s Dark Knight trilogy, The Prestige, Inception, Interstellar and Dunkirk. Also a seasoned comedic actor, Caine appeared in the cult classics Dirty Rotten Scoundrels opposite Steve Martin, Austin Powers in Goldmember opposite Mike Myers and Miss Congeniality opposite Sandra Bullock. In 1992, Caine was appointed Commander of the Order of the British Empire (CBE) and in 2000 he was knighted by Queen Elizabeth II, both for his services to the arts. In January 2018, he was ranked the 15th highest grossing actor of all time according to Business Insider. Matthew Goode plays the endearingly awkward dad David. Goode most recently starred in the Academy Award-nominated film, The Imitation Game opposite Benedict Cumberbatch. His television roles include the Golden Globe and Emmy winning series “Downton Abbey” and Netflix’s Golden Globe-winning series “The Crown”. His additional credits include CBS’s “The Good Wife”, Allied starring opposite Brad Pitt and Marion Cotillard, and WB’s Watchmen.